Jeffrey Hopson goes for the ball. 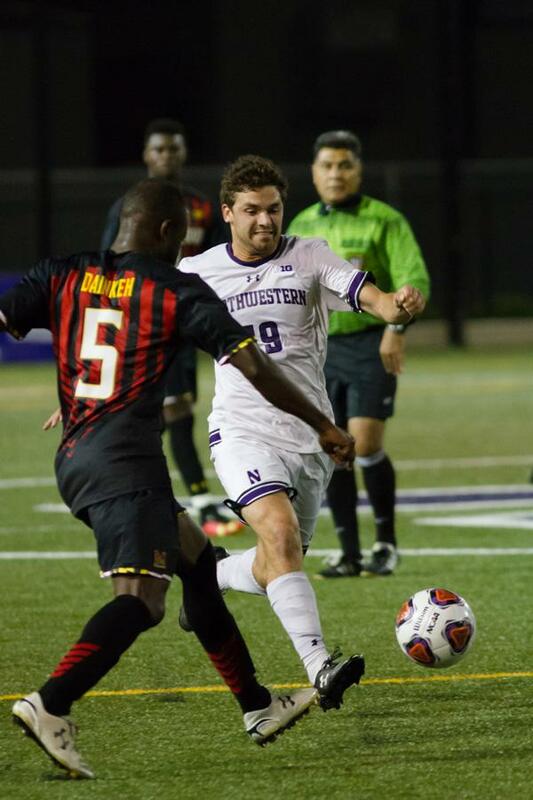 The senior midfielder and the rest of Northwestern couldn’t find the net and suffered another loss at UCF on Wednesday. Once again, the goal didn’t come for Northwestern. The Wildcats (2-8-1, 1-3-1 Big Ten) suffered a 1-0 loss in Orlando, Florida, against UCF (3-5-0) Wednesday night, leaving the team heartbroken as it prepared to leave the city before Hurricane Matthew makes landfall. With the match scoreless through the first half and much of the second, the Knights took the lead late in the game and rode out the victory. UCF midfielder Anton Delwer scored the decisive goal, his first of the season, in the 73rd minute. Ten minutes later, NU junior goalkeeper Francisco Tomasino received a red card as he stopped the Knights’ second potential goal. Tomasino, who was ejected from the game and replaced by redshirt freshman Braden Thuraisingham, won’t be allowed to play in Tuesday’s game against UIC. Junior forward Elo Ozumba, who took the shot on NU’s last chance to score in the 85th minute, said Tomasino’s goal-saving play was the right one. “If we had gone 2-0 down, it would have been no hope for us,” Ozumba said. Thuraisingham was pressed into action because fellow redshirt freshman Robbie White suffered a lower extremity injury with a seven-to-eight week recovery period in a shutout of then-No. 3 Indiana on Sept. 18. The regular third-string keeper will be the Cats’ starter against UIC. After a relatively uneventful first 20 minutes, Ozumba and sophomore midfielder Camden Buescher came onto the field, speeding up the game’s pace. Buescher shot twice in the first half, improving NU’s chances for a first goal. The goal never materialized, though, leaving the Cats with another defeat in a tough season. Buescher said he believes the team could have been more efficient with its chances.